Eastsensor use three types of fluid compound to fill according to the requirement of measurement process, each has different temperature performance. Any difference of pressure across the cell causes the diaphragm to flex in the direction of least pressure. The sensing diaphragm is a precision-manufactured spring element, meaning that its displacement is a predictable function of applied force. The applied force in this case can only be a function of differential pressure acting against the surface area of the diaphragm in accordance with the standard force-pressure-area equation F = PA. In this case, we have two forces caused by two fluid pressures working against each other, so our force-pressure-area equation may be rewritten to describe resultant force as a function of differential pressure (P1 − P2) and diaphragm area: F = (P1 − P2)A. Since diaphragm area is constant, and force is predictably related to diaphragm displacement, all we need now in order to infer differential pressure is to accurately measure displacement of the diaphragm. A capacitance detector circuit connected to this cell uses a high-frequency AC excitation signal to measure the different in capacitance between the two halves, translating that into a DC signal which ultimately becomes the signal output by the instrument representing pressure. 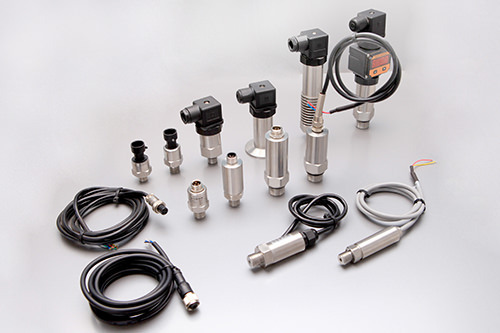 These pressure sensors are highly accurate, stable, and rugged. An interesting feature of this design – using two isolating diaphragms to transfer process fluid pressure to a single sensing diaphragm through an internal “fill fluid” – is that the solid frame bounds the motion of the two isolating diaphragms such that neither one is able to force the sensing diaphragm past its elastic limit. As the illustration shows, the higher-pressure isolating diaphragm gets pushed toward the metal frame, transferring its motion to the sensing diaphragm via the fill fluid. If too much pressure is applied to that side, the isolating diaphragm will merely “flatten” against the solid frame of the capsule and stop moving. This positively limits the isolating diaphragm’s motion so that it cannot possibly exert any more force on the sensing diaphragm, even if additional process fluid pressure is applied. This use of isolating diaphragms and fill fluid to transfer motion to the sensing diaphragm, employed in other styles of differential pressure sensor as well, gives modern differential pressure instruments excellent resistance to over-pressure damage. It should be noted that the use of a liquid fill fluid is key to this overpressure-resistant design. In order for the sensing diaphragm to accurately translate applied pressure into a proportional capacitance, it must not contact the conductive metal frame surrounding it. In order for any diaphragm to be protected against overpressure, however, it must contact a solid backstop to limit further travel. 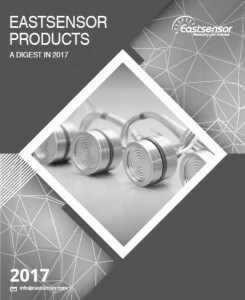 Thus, the need for non-contact (capacitance) and for contact (overpressure protection) are mutually exclusive, making it nearly impossible to perform both functions with a single sensing diaphragm. Using fill fluid to transfer pressure from isolating diaphragms to the sensing diaphragm allows us to separate the function of capacitive measurement (sensing diaphragm) from the function of overpressure protection (isolation diaphragms) so that each diaphragm may be optimized for a separate purpose. Here, the left-side isolating diaphragm is clearer to see than the right-side isolating diaphragm. A feature clearly evident in this photograph is the small clearance between the left-side isolating diaphragm and the internal metal frame, versus the spacious chamber in which the sensing diaphragm resides. Recall that these internal spaces are normally occupied by fill fluid, the purpose of which is to transfer pressure from the isolating diaphragms to the sensing diaphragm. As mentioned before, the solid metal frame limits the travel of each isolating diaphragm in such a way that the higher pressure isolating diaphragm “bottoms out” on the metal frame before the sensing diaphragm can be pushed past its elastic limit. In this way, the sensing diaphragm is protected against damage from overpressure because the isolating diaphragms are simply not allowed to move any farther. As is the case with most of capacitance differential pressure transmitter, this instrument has two ports through which fluid pressure may be applied to the sensor. The sensor, in turn, responds only to the difference in pressure between the ports. The differential capacitance sensor construction is more complex in this particular pressure instrument, with the plane of the sensing diaphragm perpendicular to the plane of the two isolating diaphragms. This “coplanar” design is more compact than the older style of sensor, and more importantly it isolates the sensing diaphragm from flange bolt stress. Take particular note of how the sensor assembly is not embedded in the solid metal frame as was the case with the original Rosemount design. Instead, the sensor assembly is relatively isolated from the frame, connected only by two capillary tubes joining it to the isolating diaphragms. This way, stresses inside the metal frame imparted by flange bolts have virtually no effect on the sensor. The “supermodule” series of Rosemount capacitance differential pressure transmitters shares the same coplanar design as the earlier 3051 models, but adds a new design feature: inclusion of the electronics within the stainless-steel module rather than the blue-painted upper housing. This feature allows the transmitter size to be significantly reduced if needed for applications with limited space. EST4300 Capacitance Differential Pressure Transmitter has the same function which Rosemount 3051 has. Find out details of EST4300 series, please click below links.